So writes Dmitry Orlov (www.cluborlov.blogspot.com) in edited excerpts from his original article* entitled Five Stages of Collapse. 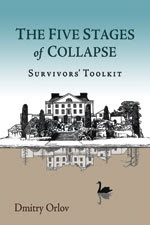 [Instead,] I think that the stage 1 (financial) and stage 2 (political) collapses will compress into a single chaotic episode. Commercial collapse will not be far behind, because global commerce is dependent on global finance, and once international credit locks up the tankers and the container ships won’t sail. Shortly thereafter it will be lights out.